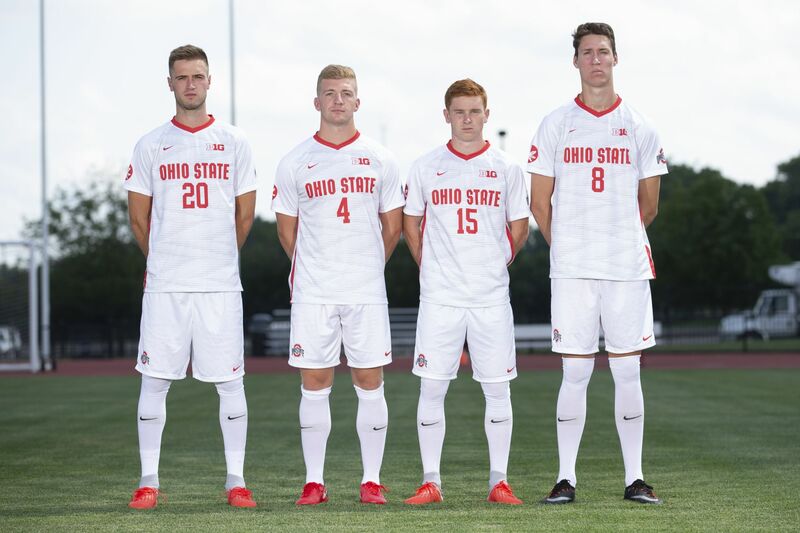 COLUMBUS, Ohio – The Ohio State men’s soccer team begins the 2018 regular season by hosting the 13th-annual Bert & Iris Wolstein Classic this weekend where it will take on Furman at 7 p.m. Friday before facing Hofstra at 2:30 p.m. Sunday at Bert L & Iris S. Wolstein Field at Jesse Owens Memorial Stadium. Dayton rounds out the tournament field and opens the tournament against Hofstra at 4 p.m. Friday then meeting Furman at Noon Sunday. Live stats will be available for each match on OhioStateBuckeyes.com. The OSU matches will be streamed on BTN Plus ($). Fans can also follow Buckeyes with updates on twitter via @OhioState_MSOC. Links can be found on the OSU men’s soccer schedule page. • Ohio State will take the field on Friday night for the first time under first-year head coach Brian Maisonneuve. • Maisonneuve was associate head coach at Indiana University, guiding the team to the 2012 NCAA national title. 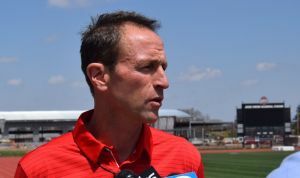 He was a member of the Columbus Crew from 1996-2004. • Ohio State returns six starters from the 2017 squad and welcomes seven newcomers. The Buckeyes lost seven letterwinners and five starters from the team that finished 8-10-1 overall and 3-5 in conference play. • The Buckeyes were picked tied for sixth with Penn State in the Big Ten preseason poll announced last week. Indiana was picked as the preseason favorite followed by Michigan State, Maryland, Michigan and Wisconsin. • Senior Brady Blackwell, redshirt junior Parker Siegfried and sophomore Will Hirschman were named to the Big Ten preseason honors list. The Buckeyes are 28-26-11 in lidlifters all-time. The 2018 opener vs. the Paladins will be the first match under first-year head coach Brian Maisonneuve. The annual Bert and Iris Wolstein Classic, now in its 13th year, is named in honor of the family that first brought professional soccer to Ohio in 1979. From 1979-1988, the late Bert Wolstein (2004) was the owner and president of the Cleveland Force of the Major Indoor Soccer League. Since them, the Wolstein support of Ohio State has been nothing short of generous. The most recent major act of a giving was a $1.5 million gift to the Department of Athletics, resulting in the naming of the field at Jesse Owens Memorial Stadium, as part of a $4.9 million total gift to the university in September 2012. The Wolsteins previously made a major contribution in 2001 to the Ohio Stadium renovation project, prompting the dedication of the Iris S. and Bert L. Wolstein Football Center in the southwest tower. 1996-2004 and was a member of the United States’ 1998 World Cup team. Maisonneuve is assisted by associate head coach Sergio Gonzalez, assistant coach Matt Foldesy and director of operations Chad Barson. The Buckeyes are 19-12-7 all-time in their early season home tournament. Ohio State has captured the tournament title six times (2006-2009, 2011 and 2012). Last year, the team beat Pitt, 1-0, before falling to FIU, 3-0.
the preseason All-Southern Conference Standings, while five Paladins earned preseason honors, including Josiah Baker, Danny Kierath, Cole McLagan, Dalton Souder and Laurence Wyke. Furman finished the 2017 season with a 12-5-3 overall record and 5-2-3 leauge mark. Wyke led the squad with 22 points (9g, 4a). Hofstra was picked fourth in the CAA preseason poll after finishing the 2017 season with a 6-6-6 overall record and 3-1-4 mark in league play. Luke Brown (3g, 3a) and Oscar Ramsay (3g, 3a) return for the Pride offensively, while senior goalkeeper Alex Ashton is back after collecting a 1.22 GAA with 62 saves a year ago. a 9-8-2 overall record. Junior forward Rok Taneski led Dayton with 27 points (10g, 7a) a season ago. The Buckeyes and Flyers met last weekend in an exhibition match in Dayton, Ohio, and battled to a 0-0 draw. Dayton assistant coach Alex Ranalli returns to Columbus after playing for the Buckeyes from 2013-16. Ohio State holds a 112-47-27 record (.675) in Jesse Owens Memorial Stadium since the facility opened in 1999, including 19 victories in the last three seasons. Head coach Brian Maisonneuve and his staff welcomed a total of seven new faces to its 2018 roster. The incoming class is made up of two transfers and five freshmen – Osman Fofanah, CC Uche, Xavier Green, Cory DuBois, Colin Lynch, Chaise Thiel and Daniel Wee. After missing last year due to injury, redshirt junior transfer Jake Scheper and redshirt freshman Devyn Etling are ready to make an impact this fall. The Buckeyes’ schedule includes 10 matches at Bert L. & Iris S. Wolstein Field at Jesse Owens Memorial Stadium this season with home Big Ten action kicking off Sept. 21 against Northwestern. Admission is free to all Ohio State men’s soccer regular-season home games. The Ohio State men’s soccer team will make two appearances on national television this fall. The Buckeyes will be seen on ESPNU Sept. 25 at Michigan and BTN Sept. 30 at home against Rutgers. All other home matches will be on BTN Plus ($). Ohio State travels to play in the Dayton Classic Aug. 31 and Sept. 2 to compete against Marshall and Milwaukee.